The field we were monitoring in Leamlara was harvested on September 12th. It was fertilised with OMEX Nitroflo 26 + s on July 23rd and we updated it’s growth periodically since then via Facebook and Instagram. It yielded 11 round bales per acre…….. Outstanding crop of grass………. Southern Fuel & Farm Supplies Ltd Cork and Jordan Agri Ltd Carlow are distributors for Omex Liquid Fertilisers in Southern Ireland. 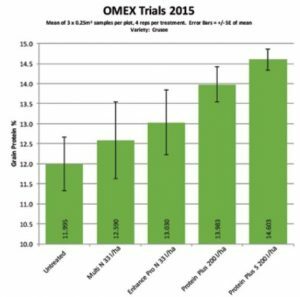 Omex advanced liquid fertiliser formulations coupled with significant improvements in Sprayer Technology have brought Liquid Fertiliser Application into favour again. 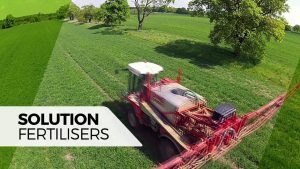 The key benefits of greater accuracy, reduced leaching, improved speed and mode of uptake, and simple application, have increased usage of Liquid Fertiliser in the UK to 25% of total fertiliser applied by UK farmers. From small beginnings in 2016 in the north east of Ireland the volume jumped 10 fold in 2017, and is predicted to rise significantly again in 2018. Recently when farmers in that north east region of Ireland were asked for their views having used OMEX Nitroflo for the previous 2 years, they said they would not be returning to granular bagged product. A key benefit was found in Ireland at 2017 in Winter Barley crops when many farmers suffered a yield reduction that year because of the unusually dry spring in 2017. Poor uptake of Nitrogen because of the dry weather at time of application is considered a major cause of the yield drop in Winter Barley. Interestingly those that applied Liquid Nitroflo in the spring of 2017 did not suffer a yield reduction and maintained yields similar to their 2016 crops. While Liquid Fertiliser is considered very much a tillage man Fertiliser, recent work on some of the bigger dairy farms in the UK is showing advantages in terms of reliability in speed of uptake by the plant over granular product. By applying fertiliser in liquid form and because it is more immediately available to the grass roots, (particularly in dry weather) it was taken up by the plant quicker and the result was more tonnes of grass dry matter in the paddocks when cows were left in to graze in normal length rotations. Overall this means more tonnes of grass DM and more consistent quality over the grazing period as grass will grow more evenly. This will certainly be of interest to many Irish Dairy Farmers. Liquid Fertilisers = More efficient fertiliser. 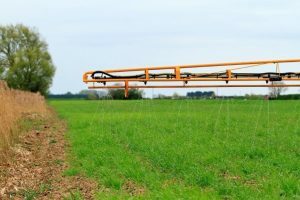 Liquid fertiliser is easy to store, simple to apply, and can be targeted with an accuracy that traditional solid fertiliser just can’t match. More and more agricultural producers are turning to the efficiency of liquid fertiliser, saving time, money and manpower. The OMEX range of liquid nitrogen fertilisers has been specially formulated to offer some of the most concentrated liquid nitrogen nutrition available. • The OMEX Nitroflo liquid fertiliser range includes some of the most concentrated products available. • They are delivered for farmer application and offer many advantages over conventional solid fertiliser application in terms of accuracy, consistency and ease of use. 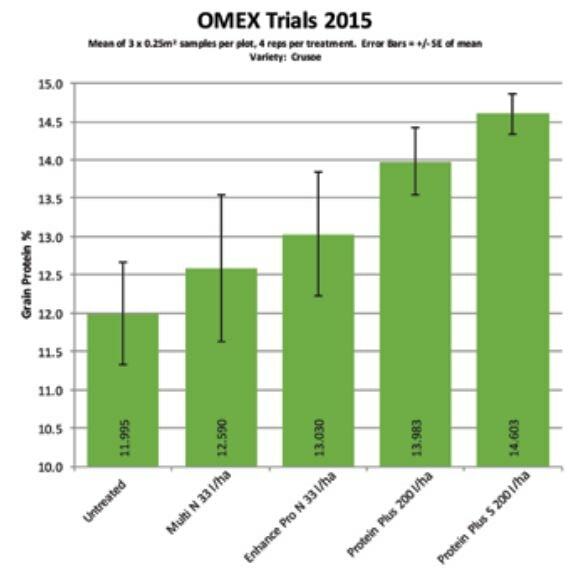 • By using OMEX solution fertilisers, farmers save time, protect the environment, comply with NVZ and Cross Compliance requirements and maximise crop yields. and provide major handling and storage advantages over solid fertilisers. guidelines, scorch is not a problem. A All nitrogen fertilisers can be mildly corrosive to unprotected steel. than if it was used for conventional spraying alone. have a bund, and the sprayer supplier will confirm whether any modifications are necessary. increase in protein than that achieved by soil application. Consult Our Team to find out more about Liquid Fertliser. HOW LONG WILL IT BE BEFORE FARMERS ARE SPREADING LIQUID FERTILISER BY DRONE ??? Minister of State for Training, Skills, Innovation, Research and Development John Halligan has today announced funding of €6.3 million for drone technology. The funding – which consists of €1.8 million from Science Foundation Ireland (SFI), and a further €4.5 million investment from industry (cash and in-kind) – will be going to a new drone technology initiative known as U-Flyte.